Nowadays, I see a lot of information in the internet about the capability of lightning to multiply mushrooms. In addition, I often see in Japanese TV news programs that the Iwate University of Japan and others did research about mushroom growing by applying man-made lightning. But this information is not new to me. Sixty years ago, when I was still a kid, I used to work as a helper in the farm with my uncle. Whenever there's heavy rain showers and thunder in the middle of the farmland, I had to run to the small straw cabin. My uncle and grandparents told me that thunder and lightning provoke plentiful harvests of our crops. And this 400-year old legendary Japanese farming folklore proved true. 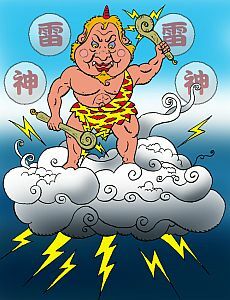 A Japanese legendary story tells us that the god of thunder create lighting and thunderbolt. Many of us believed. As a small boy, I myself believed the folklore. When I entered high school, I read something that the good effect of lightning to crops is caused by the ozone produced by the lightning. In fact, about 40 years ago, I have done research about it by applying static electricity to a variety of been sprout, rice, mushroom, vegetable, and banana. Yes, almost all vegetables had appeared to have benefited from static electricity, though not as much as I was expecting. The cost of the machine for wide scale application and other maintenance expenses hindered its use for vegetable production. Thus, I stopped the research for quite a long time. But for your interest, I'll give you some ideas. Static charge that is positive in polarity did not give any good result based on my experience and study. However, if the static charge is negative in polarity, the sprout grows few hours ahead compared to the non-applied one. Rice – grows taller and stronger, and produces slightly more crops. Mushroom – depends on the species. Some did well. Some disappeared. Vegetables – we did not see any noticeable differences. Green banana – harvested green banana showed slower ripening process, keeping it fresh for a longer duration of time. 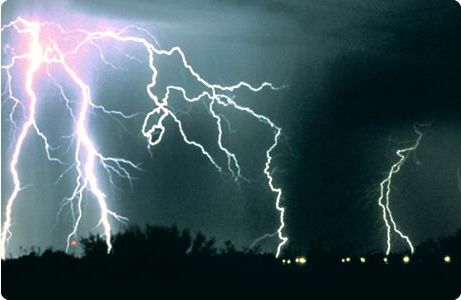 Lightning is the product of massive amounts of static electricity. It is just the same as the PYRO-ENERGEN electrostatic therapy machine. The PYRO-ENERGEN is a miniaturized version of lightning. If you own a PYRO-ENERGEN machine, place your subject on the machine's mesh net or metal plate, and see the result. Actually "static electricity" is not electricity that is static. Static electricity is an imbalance in the amounts of positive and negative charges found within the surface of an object. It is only the imbalance between opposite charges that is important. This static electricity will be discharged through the low resistance path to the atmosphere between the cloud and the ground. That is the lightning, and the sound produced is the thunder.